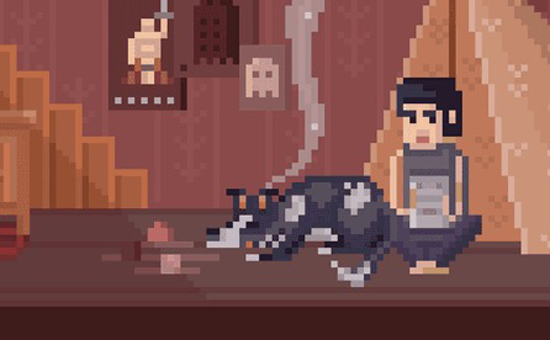 Visit a wonderfully peculiar dog's dream in a heroic attempt to save your owner in this beautiful pixel art puzzle platformer. A kid named Dustin goes into a coma after being hit by an ice cream truck. His injuries are serious and there is virtually no hope of him waking up. His dog sleeps by his side, dreaming of strange and mysterious lands filled with canine wonders. It is Balthazar - Dustin's best friend and there is no way in the world he will move even an inch away from his owner. In his dream Balthazar senses a presence of two entities. Recognizing one as Dustin he uses his nose to follow him, while the other presence lurks menacingly in the darkness. Balthazar is sure that it is here to take the boy away. Download a free demo for PC and Mac on the site. With a loud bark Balthazar embarks on a quest to save his owner, venturing through the dreamscape with love and determination only a dog can possess.